We are always trying to show you the best candy buffet designs out there. Some of them are simple and elegant and easy to put together on your own. Others are elaborate and ornate with props and special favors and generally blow the minds of all their guests. This is one of those. Most candy buffets are rainbow colored discount bulk candy extravaganzas straight out of Willy Wonkas factory and into your event. What struck us about this dessert and candy buffet table designed by The Social Event Company of Southern California is the polished style and subtle extravagance. The color choice actually goes completely against what most candy buffets strive to exude. You could call it a brown candy buffet, but that doesn’t begin to do justice to the nuances of the creation you see above. Take note of the complimentary tones of brown among the different candy and props on the table. They work well with each other, but don’t risk blending together in such a way that could make a brown dessert table seem bland. Texture is a big reason for that. All the decorations from the centerpiece truck to the film box on the right have a classy trim of sophistication that is appealing to the eye. 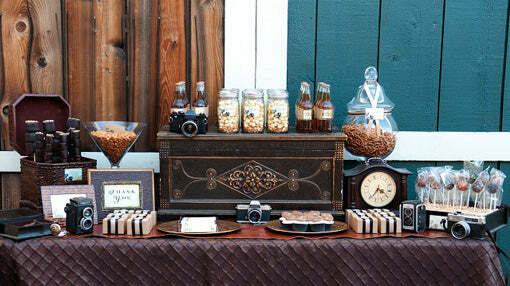 The camera and old school clock give it a period piece feel and combine with the rest of the arrangement to create a more gender neutral candy buffet than one normally comes across. Take heed grooms, not all candy buffet table designs are pink and purple. It’s not all radical planning though. There are a few basic tenets that are essential for a candy buffet (or any party arrangement) and they are present here as well. The biggest one is symmetry. Though this buffet is not exactly 100% symmetrical, that’s not what a great candy buffet looks to achieve. What you want is a general sense of symmetry combined with a felling of abundance. That abundant feel is created by skewing the symmetry just a bit, to invoke the idea: there’s just not enough room on this table for all this candy! And that’s another really important aspect of a great candy buffet table. It doesn’t matter how big or small the actual table is, but you gotta fill it up as much as you can. Empty space takes away from the abundance and leaves guests wondering if the hosts could not afford another bag of bulk M&Ms. Great job by all involved on this one. You can see more pics of this at the Sweet Designs website by Amy Atlas. I WANTED TO LEAVE A NICE COMMENT, BECAUSE I WAS VERY SURPRISED TO HAVE MY ITEMS I PURCHASED SO FAST, AND JUST WANTED TO THANK YOU FOR THE GREAT JOB YOU DID TOO.